Following the success of ‘Fireside chat 2018 with Six Bold and Daring Sri Lankan Entrepreneurs’, ICC Sri Lanka and CIMA Sri Lanka will come together again to jointly host ‘Fireside Chat 2019: featuring leading foreign envoys in Sri Lanka’. The theme of the event is ‘An International Perspective on Sri Lanka’s future’. Fireside Chat is organised by ICC Sri Lanka, CIMA and Daily FT. This year's Fireside Chat on 19 March at the Hilton, Colombo, will feature leading foreign envoys in Sri Lanka. The event will feature nine foreign ambassadors, from the UK, China, EU, Bangladesh, Malaysia, Indonesia, Netherlands, Canada and Switzerland. 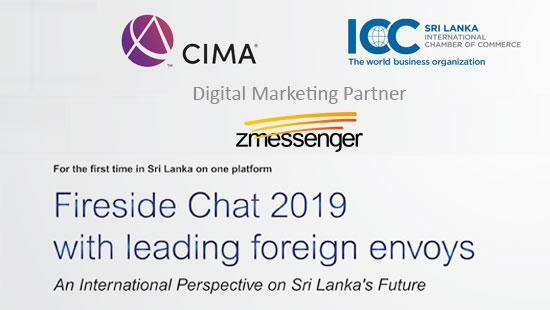 The envoys will provide an international perspective on Sri Lanka’s future and will be moderated by Mr. Dinesh Weerakkody, Chairman of ICC Sri Lanka and Mr. Nisthar Cassim, Editor of Daily FT.
Z Messenger is proud to be associated with the Fireside Chat as the Digital Marketing partner at this event. The highlight of the event will be the closing session with Prime Minister Ranil Wickremesinghe, who will discuss some of the key challenges facing Sri Lanka and the way forward. Mr. Dhammika Perera, a prominent entrepreneur and investor in Sri Lanka will join Hon. Prime Minister for a session to discuss challenges and opportunities in the business sector in the country. Mr. Perera is a first generation entrepreneur in Sri Lanka and the driving force behind a syndicate of companies in the country. His business interests include Hydropower Generation, Shipping, Manufacturing, Hospitality, Entertainment, Banking and Finance. His holding company, Vallibel One Group, has stakes in all these sectors, through its various subsidiaries, which employ 60,000 people, with 1880 based in countries other than Sri Lanka.